In May and June of 2013, we had the "Taper Tantrum" in markets, sparked by then-Fed Chair Ben Bernanke's announcement that the Fed would begin to taper its $US85 billion per month quantitative easing (QE) program. Over a four week period from May 24 to June 21, 2013, returns on all major asset classes fell as markets adjusted to the expectation that large-scale Fed purchases of US Treasuries and Mortgage Backed Securities would end. With all asset classes posting negative returns, all types of portfolios experienced losses, but some portfolios lost much more than others. 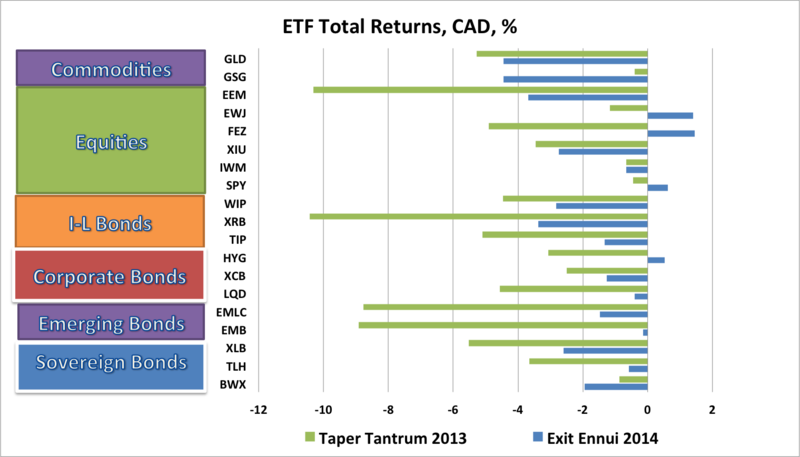 In September 2014, we are experiencing the sequel to the Taper Tantrum, which I will call Exit Ennui. This sequel was triggered, I believe, by Fed Chair Janet Yellen's speech at Jackson Hole. There was nothing wrong with the speech. It was surprisingly balanced. While Yellen is widely perceived as occupying a position near the dovish extreme on the Hawk-Dove spectrum among FOMC members, she did not make a dovish speech at Jackson Hole. That was left for ECB President Mario Draghi and the main result was to highlight the divergence in economic performance between the world's two largest economies: US relative strength versus Eurozone relative weakness. In the weeks since Jackson Hole, US economic data has retained a strongish bias and attention has focussed on when the Fed will begin to raise official interest rates and what form the exit strategy will take. In the wake of Yellen's Jackson Hole speech the 10-year US Treasury yield moved up from 2.34% on August 27 to 2.62% on September 16, ahead of the Fed decision on September 17. In the chart below, I compare returns on the ETFs that I regularly track during the Taper Tantrum with those seen to date (as of September 22) in the Exit Ennui. The returns are in Canadian dollar (CAD) terms and it is interesting to note that during the first four weeks of the Taper Tantrum, the CAD weakened 1.3% versus the USD, while in the Exit Ennui it has weakened a very comparable 1.4%. The Exit Ennui has not yet done as much damage as occurred during the first four weeks of the Taper Tantrum. In both periods, all asset classes performed relatively poorly. Nominal bonds, inflation-linked bonds, credit, equities and commodities all sold off to varying degrees. Inflation-linked bonds were relatively hard hit in both periods. Emerging Market assets have fared relatively better in the Exit Ennui than they did in the Taper Tantrum. Long-duration bonds performed relatively poorly in both episodes. 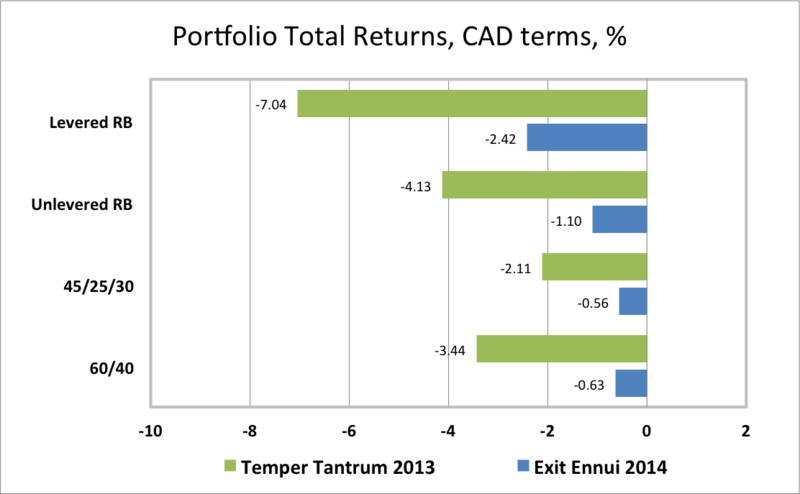 Portfolio choices make a big difference during drawdown periods like the Taper Tantrum and the Exit Ennui. The chart below shows the performance of the four portfolios that I regularly track. The traditional Canadian 60% Equity/40% Bond ETF Portfolio, which lost 3.44% during the Taper Tantrum is down just 63 basis points so far in the Exit Ennui as equities have not been hit as hard this time around. A less volatile portfolio for cautious investors, comprised of 45% global equities, 25% government and corporate bonds and 30% cash, which lost just 2.11% in the Taper Tantrum is down 56 basis points in the Exit Ennui. Risk balanced portfolios posted larger losses in both periods. A Levered Global Risk Balanced (RB) Portfolio, which uses leverage to balance the expected risk contribution from the Global Market ETFs, lost 7.03% in the Taper Tantrum and is down 2.42% so far in the Exit Ennui. An Unlevered Global Risk Balanced (RB) Portfolio, which has less exposure to government bonds, ILBs and commodities but more exposure to corporate credit and emerging market bonds, lost 4.13% in the Taper Tantrum and is down 1.10% so far in the Exit Ennui. What this highlights, is that leverage has not been an investor's friend during periods in which markets are pricing in reduced Fed monetary accommodation. During these drawdown periods, cash is often the best asset class, which is why the 45/25/30 portfolio tends to perform best during these episodes.